The Thermo Scientific Sorvall ST8R Refrigerated Centrifuge is an powerful little instrument in an efficiently designed footprint. 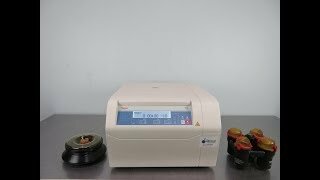 This compact benchtop centrifuge is microprocessor controlled with an easy to use, brightly back lit interface. Users can program set times, continuous runs, access 3, one-touch, protocols, set password protection and even temperatures. The temperature of this refrigerated centrifuge is between -10°C and +40°C. The Thermo Sorvall ST8R refrigerated centrifuge has low noise levels at <52 dBA so to keep it nearby wouldn’t be a distraction. This benchtop centrifuge features acceleration and deceleration profiles as well as a coast to stop, and traditional start stop. While in operation this lab centrifuge can reach speeds of 4500 RPM and a max RCF of 3260 x g. The rotors for this thermo centrifuge have an auto lock feature to ensure quick exchange and proper placement, and a SMARTspin imbalance warning system if loads are uneven. This Thermo Sorvall ST8R Centrifuge comes with 2 rotors, has been thoroughly inspected and is performing to expectations. All of our lab equipment comes backed with our standard warranty. Should you have any questions, please don't hesitate to contact us.